I found this recipe on a blog, and have made it twice now. Both times it turned out perfectly. 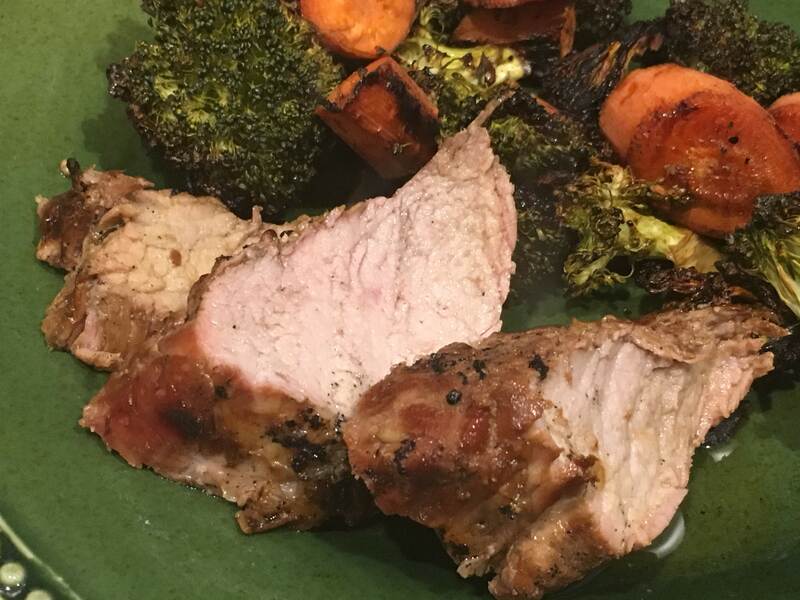 The original recipe says you can marinate the pork for up to a day in the refrigerator, but I do it just for an hour or so. That’s plenty long. If you want to marinate it longer, that’s fine. 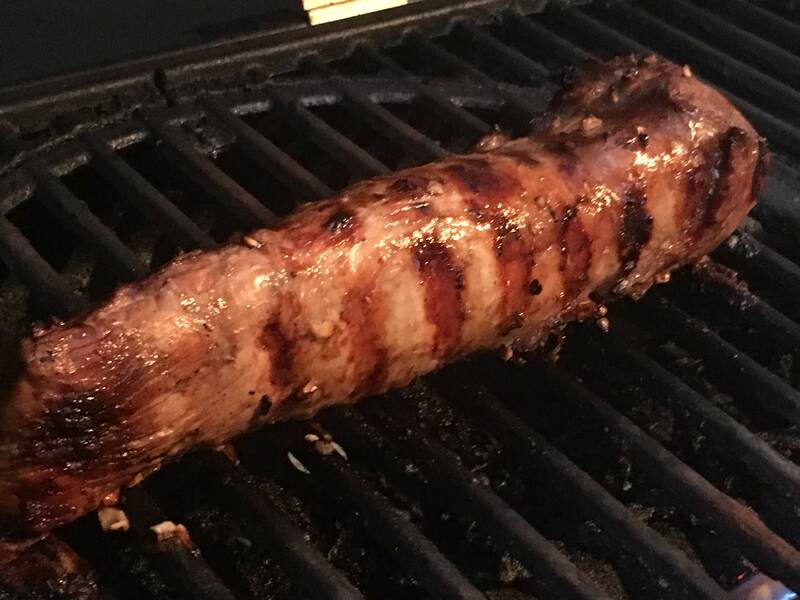 The result is an amazing pork tenderloin that is good warm off the grill, or even cold after a few days in the fridge. You won’t regret giving this a try. I tried using the marinade that was left over to make grilled vegetables while the meat was on the grill, but didn’t love the flavor. So throw away the excess marinade and make your vegetables with your favorite method. Mix all ingredients together except for the pork in a a large Ziplock bag. Place the tenderloin in the bag and squeeze out as much air as possible before sealing. Place the bag in the refrigerator and marinade for 1 hour (or longer). Remove the tenderloin from the marinade about 30 minutes before you are ready to grill and place it in a bowl on the counter so it can release excess juices and come to room temperature. Heat the grill to medium-high heat. Place the tenderloin on the grill, away from direct flames if using a gas grill. Close the lid and grill for 5 minutes. You are looking for a crust to form on the outside of the meat, but not too much charring. See pictures below. 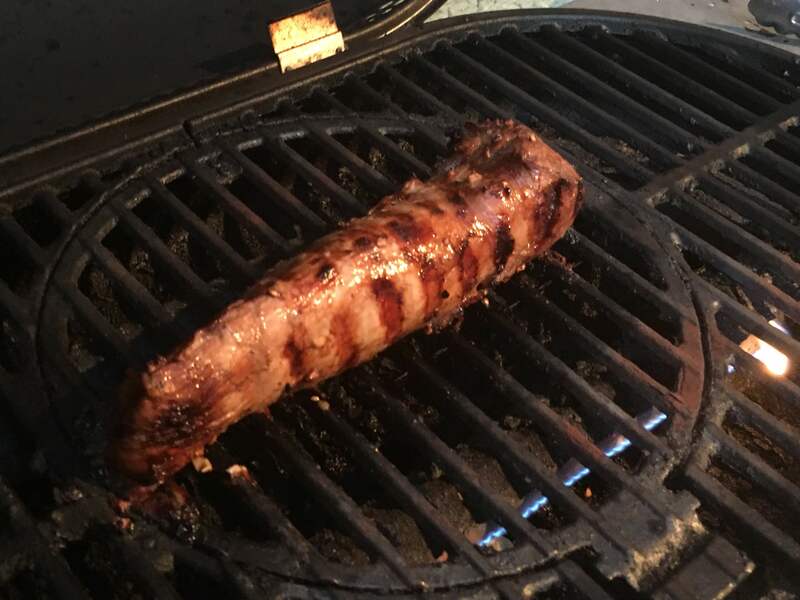 After 5 minutes, roll the tenderloin onto the the next side and grill for another 5 minutes with closed lid and medium heat. Repeat with 5 minutes per side until all 4 sides have been grilled for a total of 20 minutes. 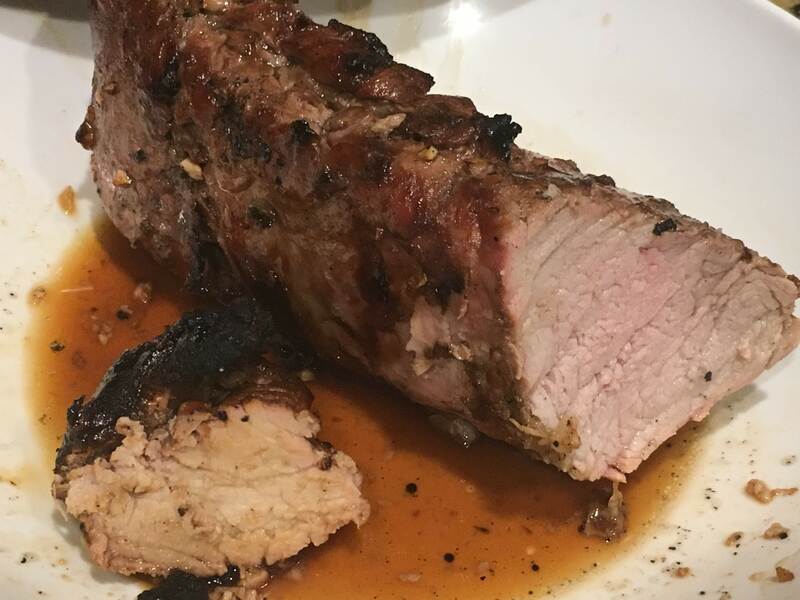 Allow the grilled pork tenderloin to rest on a plate or bowl for about 10 minutes before you slice into it. I did this uncovered but if you cover the meat, it will stay warmer. Move to a serving platter and slice. The ends will be more well done, and the center will be slightly pink. Either section is tender and tastes great.